We are proud to announce Mr and Mrs Muslu have been an established Dry cleaning service since the early 1980's. 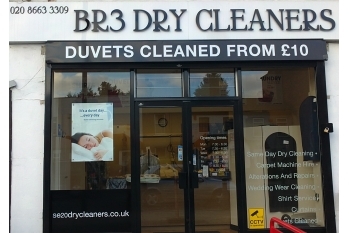 The BR3 Beckenham Branch Kent has had outstanding reviews and has currently built a reputation within the UK for its personalised specialist customer services. For more than 25 years experience the Muslu family has been dedicated to providing the finest in quality fabric care. The establishment is well equipped with the latest technology advanced and machinery available, together with their combined knowledge and skills their service has been taken to an outstanding profile. Whether you entrust them with a couture suit, an elaborate gown, wedding items or casual clothing, rest assured that your fabrics will receive the utmost personal care. Not only do Mr and Mrs Muslu manage their premises on a daily bases they also offer the opportunity of a free delivery service to your doorstep.